2014 was another great year for the Stonebrook team. Not only was our show year full of rewards, but we had the opportunity to attend some fabulous clinics, and above all else, spend some quality time with friends and of course, our horses! had another stellar year in the show ring!! In addition to multiple high scores and wins, they had the opportunity to compete again at the USDF National Championship and won numerous year end awards. The potential in this fabulous horse has yet to be untapped! continued their pursuits in obtaining the strength, training, and experience to be successful in the FEI Ring. After many years, Regentanz returned to the show ring last year at 3rd and 4th levels.............. and he performed beautifully! Having taken such a huge leap from Training Level to 3rd Level, Claudia decided to keep him at the same levels for 2014. But the goal this was not just to get back in the ring, but to develop confidence, strength, and the solid training they would need to progress into the FEI levels. 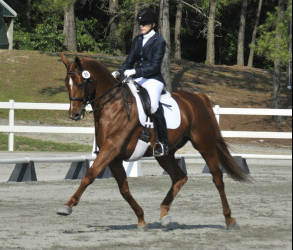 While competing, the pair trained regularly at Chis Hickey and Janet Foy Clinics. And the result was exactly what they were striving for. They finished the year with the perfect ride that placed them 3rd in the Regional Championships by receiving a 76% from one of the judges! Champion - BLM Championships 3rd Level Senior "B"
Our Riders also had a fantastic year with many exciting scores, ribbons and awards. In addition to their placings at individual shows, we'd like to congratulate them on their overall performance through out the season. We look forward to cheering you on in 2015!! Jean's first ride of this season was only her 2nd recognized competition ever! So, basically, out of the starting gate, the two of them formed a lovely relationship through the year and accomplished their goals together and even more. They consistently scored in the 60's and 70's with high score of 77% and performed a TL Freestyle!!! By the end of the season they were competing at 1st! Region 1 Championships qualifier and competitor in AA Training Level placing 13th out of 27 horses with a 67.7%! While "Dr." Nicks is no stranger to the show ring, her new partner was. Bred, owned, and ridden by Barbara, Baccalaureate is a young, feisty, and incredibly talented mare. Expertly guided through her first show season, the pair became a confident team, who moved successfully up to 1st level by the end of the season! Claudia Novick and Marco Von Laar have another fantastic year together. Top honors and a trip to the Kentucky Horse Park to compete at the inaugural USDF National Dressage Championships!! Claudia and Remy have already qualified for 2014 NCDCTA Championships, BLM Championships, and Region 1 Championships at 2nd level. They will debut their 2nd level freestyle this spring with the hopes to qualify for Nationals again and next to compete at 3rd level. Mallory Kridler’s Texas Star sweeps up in her first show season!! When Mallory left her Texas home for an education at LSU, she also left her competition mare at home with her mother. While she was in school, that mare produced two beautiful fillies and when Mallory decided she needed to get back in the saddle……….she took a trip home and fell in love with a young mare and her bright white Star. And so the story begins. A barely broke 4 year old travels half way across the country to start her new life with her new mom. And Mallory could not have been more blessed. A late bloomer, Star continues to amaze us daily with her intelligence, talent, and style. Her first trip off the property to a clinic showed what an amazing personality she has. She went straight to work without a twitch of an ear. With her second trip off the property, Claudia rode her in her first show and she’s been in the blue’s ever since. Claudia is thrilled to have the opportunity to train and show this fabulous mare and is looking forward to seeing Star and Mallory in the show ring together soon. 5 years ago I found wonderful 4 yr old that I imported from Germany. 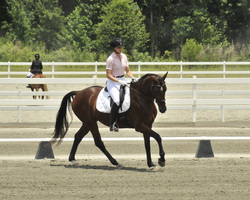 We had a fantastic show season at Training Level, attended a few clinics, and he was wonderful! Then we disappeared…….He got injured, I got pregnant (with Twins!! ), I got injured, and when we were all back in one piece, years had flown by. So, after getting us both back into shape, we headed out for our first show in 4 years and went from Training level to 3rd and even finished the year at 4th! What an awesome boy. I’m so proud of my red headed “Hot Tamale” and a huge Thank You goes out to my coach, Jules Nyssen, for getting us to where we are now. our gorgeous Pinto GOV gelding by Sempatico out of Rubina MWF. 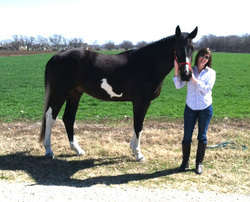 Shane has settled in beautifully to his new home in Texas and Virginia absolutely adores him. We look forward to hearing updates about the two of you and wish you all the best together!! Our 2005 colt by Diamond Hit out of Rubina MWF (Rabino/Palladium/Pik Immer) took his Adult Amateur owner, Racheal Harwell, through an unforgettable show season this year. Racheal bought Drambuie as a yearling and has done all of the training with him herself, including the initial backing. At the beginning of 2013 she set a goal to make it to Nationals and that’s exactly what she did! Congratulations to Rachael and Drambuie!!! What a great pair they make together! Mallory Kridler of Southeast Sporthorse and Jo McCracken of Mobile Horse Supply partner up to bring the best quality and most unique items available to Dressage in the Carolinas!! Claudia is proud to be sponsored by these two fabulous ladies. They have such an incredible inventory and so much knowledge. Check out their websites or visit their mobile unit at the next show and you and your horse will be the best dressed pair in the ring! http://sesporthorse.com/ Yep…..that’s me and Bobby on the Front page in one of Jo’s custom Jackets and other awesome items from their store. 2013 gives us two fabulous foals! In March, Rubina had a stunning filly by the Hanoverian Stallion Hotline. We named her Heirabella and this lovely girl has it all! Uphill conformation, flowing gaits, a beautiful head, and a “look-at-me” attitude. This is a Young Horse prospect for the serious competitor! And a little later, Dame un Besito, aka Toes, gave us a bouncing baby boy by the Hanoverian Stallion Romancero H. This colt, named Rush Hour, is one of the sweetest foals I have ever been around. He loves people and being the center of attention. He has wonderful suspension in his trot and with his temperament, should be a joy to train. 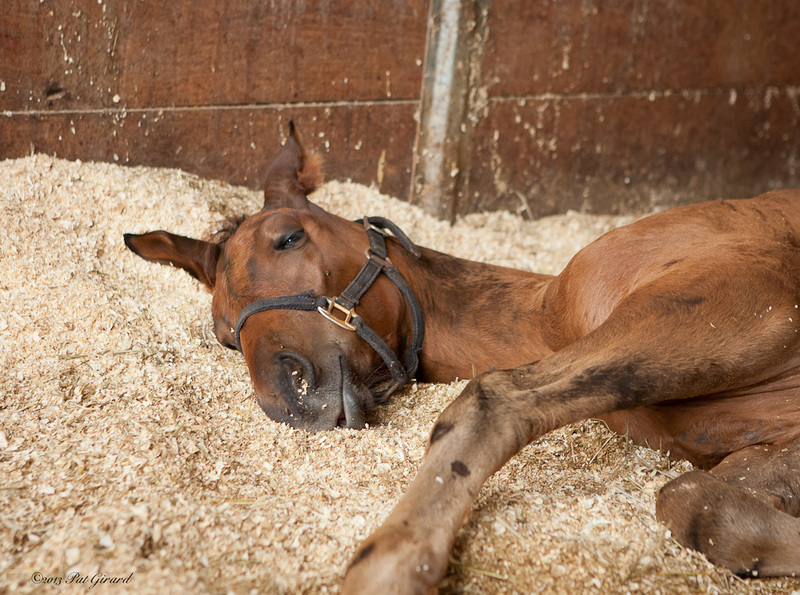 Rubina is back in foal to Hotline for 2014 and we are expecting a full Sibling to Bella in mid March. Dame un Besito will be bred to Don Principe this year for 2015. What an exciting cross that will be! 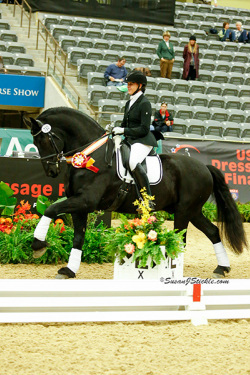 Claudia Novick and Marco Von Laar finish the 2012 show season with honors!! Claudia and Marco, aka "Remy", started this show season with record scores and continued their winning streak throughout the year. 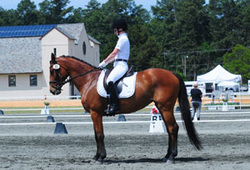 At their first show in Tryon, NC, they received not one, but two 80% from judge Kay Meredith; the high scores of the show. For the remainder of the season, they won multiple blue ribbons and in most cases were the high score of the day for the judge they showed under. As the season came to a close, Remy and Claudia swept their first championship in Raleigh, NC where Remy became the 2012 NCDCTA Open Training level Champion! 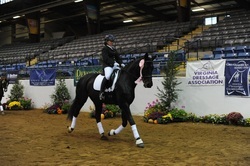 And at the final show of 2012, Remy and Claudia placed 5th at the Region 1 USDF Dressage Championships in one of the most competitive classes, Open Training Level. And this is only the beginning for this winning combination. Already scoring in the 70's at 1st level and claiming all blues, watch out for these two in 2013. In addition to the USDF classes, they will also be performing a 1st level freestyle at most shows.